Snake (Ukrainian: zmiia, hadiuka, vuzh). Any of numerous limbless, scaled reptiles of the order Squamata, related to lizards, divided into the suborders Serpentes and Ophidia and, further, into the poisonous family Viperidae and the harmless family Colubridae. In Ukraine there are only two species of poisonous snakes, the common viper (Vipera berus), found in Polisia and the forest-steppe, and the steppe viper (V. ursini). 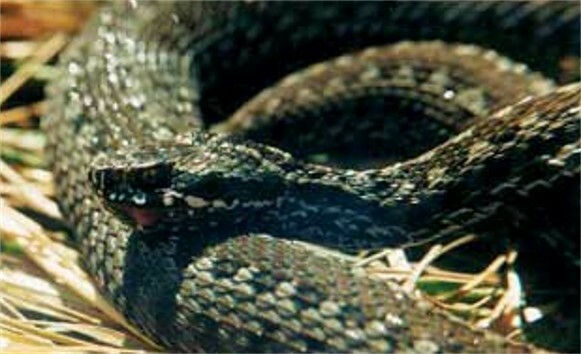 A subspecies of the steppe viper is also found in the Carpathian Mountains. Viper bites incapacitate but are not life-threatening to adult humans. The nonpoisonous snakes include the common or grass snake (Natrix natrix) and the water snake (N. tessellata).